The mud crab Scylla serrata is an important commercial crustacean being widely distributed along the southeastern coast of China. This crab and particularly its gills are subjected to seasonal fluctuations of environmental factors due to direct exposure to seawater. The investigation of seasonal variations of ATPase and antioxidant defenses in gills could be helpful for the understanding of physiological regulation mechanism of seasonal adaptations. In this study, mud crabs were collected from the subtropical waters near Xiamen island, Southeast China (24°26′46′′N, 118°04′04′′E), in August and November, 2002, and February and May, 2003, respectively, being considered as specimens from summer, autumn, winter and spring, respectively. Only healthy intermoult male crabs without carapace or appendage damage were used, having a carapace width of 7.05 ± 0.52 cm and a wet weight of 130 ± 20 g. The activities of four ATPases and three antioxidation enzymes (superoxide dismutase, catalase, glutathione peroxidase) and the content of malondialdehyde in gills were measured. The results showed that the activities of Na+, K+-ATPase, Mg2+-ATPase, Ca2+-ATPase and Ca2+, Mg2+-ATPase reached maximum levels similarly in summer and decreased in winter. The activities of superoxide dismutase and catalase were higher in summer and lower in winter, with a significant decrease in winter compared to the other seasons (p < 0.01). Glutathione peroxidase activity was higher in summer, and lower in autumn, being significantly higher in summer or winter than in spring or autumn (p < 0.01). Malondialdehyde content was higher in summer and lower in spring with significant differences among the different seasons (p < 0.01). 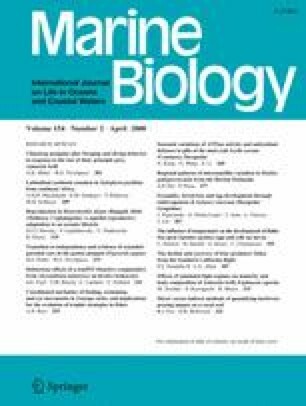 In summary, the obvious seasonal activity variations of four ATPases and antioxidant enzymes and the content of malondialdehyde reflect a seasonal regulation of the physiological metabolising enzyme and the antioxidant capacity to cope with seasonal alterations of environment factors such as fluctuating salinities and temperatures. This work was supported by a grant from the National High Technology Research and Development Program of China (863 Program) (2006AA10A406). We would like to thank Dr. Zhengrong Ma at UCLA and Hans-Uwe Dahms at NTOU (Keelung) for providing valuable comments on earlier drafts of the manuscript.